Now that I've decided to do the art show thing, I am always trying to think of things that not only will people like, but what they might like to buy. With the holiday season quickly approaching, I thought maybe Christmas cards. 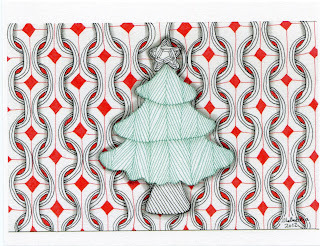 I designed a card last year to use as my own personal card and I got nice feedback from friends and family. So, as I had one design already done, I made up two more so that I can offer a few options to potential buyers. For the first one, I used Mi2 as the back ground. 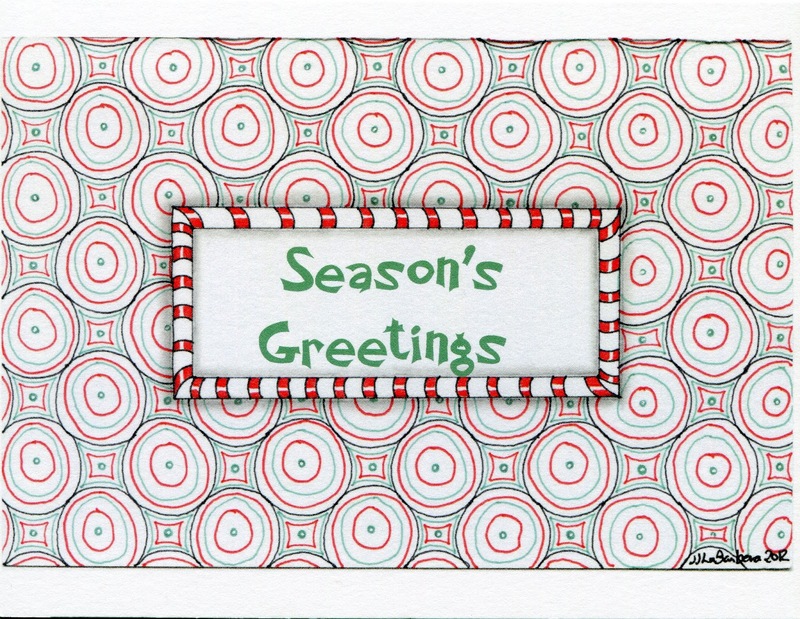 I used a red micron to make the "seeds" and the centers of the pattern. I have found that making the card large works better when going to get it printed. The original was drawn on a note card, but it leaves extra space at the top and bottom. Making the design 5X7" seems to work better. For the next design, I wanted to have a card with words on it. My handwriting/lettering is not very good so I designed a card that I could have words printed in the space. 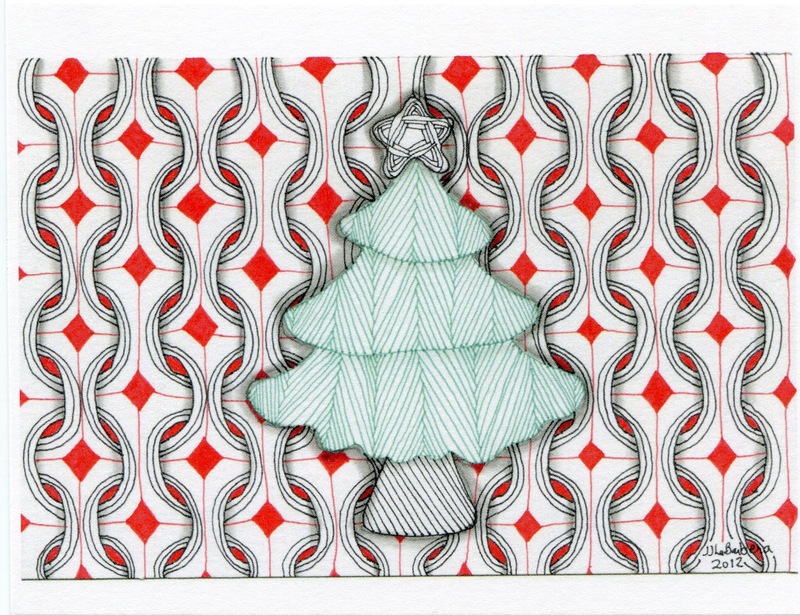 I used Huggy Bear as the back ground here, and red and green micron pens. I left the center of the card blank. 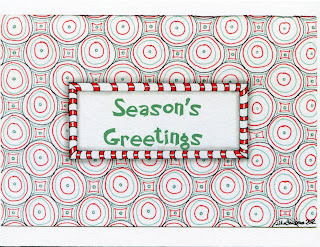 When I uploaded the card, I was able to add the Season's Greetings. It came out pretty well and I'm glad it did as I wasn't sure what I would do if I couldn't make it work. I scanned both images with my new scanner and am really happy with how they came out. The shading turns out well and when reprinted, they look good. Having the images printed on matte 100 lb card stock, they come out pretty close to the original drawings. There are a few little tweaks that I would do differently next time, but nothing that interferes with how happy I am with how these turned out. While I know you are all quite able to make your own cards, these are in my etsy shop should you like to skip the step of having your own made. Thanks for stopping by and checking out my work. I'd love to hear what you have to say.